Alright, young one, time to prove thyself to me. Let's see what you have, and see if you are truly worthy of being called...a captain. "Ahh Captain Commander, it is a pleasure to make your acquaintance"
I sense your sp shift to your knee and I sense the residue of sp on the pebble as it comes flying at me. I move to the right and hold my left hand out (which is infused with sp) and let the pebble hit my hand. As it does I relax my hand, and arm and like how satellites use planets as a slingshot to propel them faster, I spin anti clockwise with the pebble and increase it's speed (I also infuse sp into it) and send it flying back at you but at a faster pace. Using this distraction, I flick the cross guard of my sword with my right thumb, popping it up into the air and I grasp my blade and slice the air in front of me and end by pointing my zanpaktou to my right. o.o I was sorta hoping you would charge but no matter. Hm. You hit me, but then again, that was because I was just toying with you. An eye for an eye, I suppose. 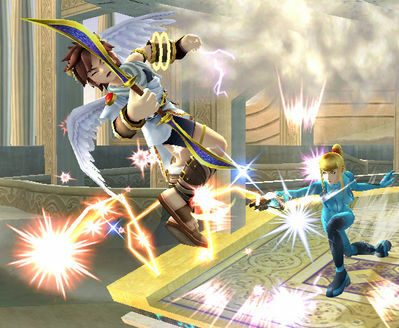 Being blind I rely on my sense of reiatsu and so when you move to my left I sense your reiatsu and your kido spell, so i use my reiatsu and I make a shield of higher rank, yet your superior sp means it breaks through and slightly pushes me back while giving me slight burns on my left arm. "Hmph, an eye for an eye aye? I remember a great saying in the world of the living, it goes "An eye for an eye, makes the whole world blind" how befitting your choice of words as I am already blind. *while i talk I hold my right arm outstretched and point the blade towards the ground and say* "Entombed in Darkness, we shall rise" darkness suddenly envelops my blade and then the darkness vanishes revealing a spear in my hand "Dākushurado!" Pointing them both at you, and then charge them for a couple of seconds, and then thrust them at you, they're about the size of basketballs I'd say, and I then divide them into 4...eh...double the size of a softball fireballs of white lightning at you. "You made a blind joke, Im merely defending my nindo......wait wrong show o.o, nvm then.."
*sending a chain of lightning from my left blade, it then immediately connects to your abdomen, and I then begin encircling you, making the chain longer and thicker, shocking you worse and worse with each encirclement. I do it about 2-3 times and then stab at your chained abdomen, forming a lock on the chain, shocking you to its full extent. I then jump back a few feet and watch you fall and stumble, shocked very badly. Tch. Is that really all you have? As you move to trap me it's obvious that your going to try a fast attack to get me quickly so all I say is "Danku" and a powerful energy barrier appears between you and me while it appears And it blocks your lightning I shunpo behind you to which I thrust my spear through your abdomen impaling you (I was already in the stance to do it quickly). Description: Creates an energy barrier in the form of a rectangular wall. 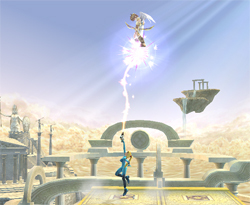 As the lightning chain is blocked by the Danku, it returns to me, and my zanpakuto is still charged due to that happening...and once I hear you appear behind me, and your spear about to near me, I jump and whip the chain back at you again, like zero suit samus in SSBB using plasma whip/wire (pictures below), and this time, since you thought you had me, it connects, and I backflip and land and start encircling you again, simply doing the same attack again, immobilizing you with your spear in hand. I encircle you 2-3 times and form the lock with my other blade and shock you even more again, and jump back and watch you squirm. Basically something of that nature connecting to your abdomen again while im in mid air. Sensing your lightning is still active when I shunpo and I sense you about to jump forward and while in warrior stance I open portal (I just have to move the spear point up which opens the portal right infront of me and your attack is sent to the Dangai, As I open the portal I channel dark reiatsu into my znapaktou and I shunpo to your right as I appear Mulitple tendrils erupt from my body and grab you (they are made from the substance found on the walls of the Dangai precipice world which are really sticky). Holding you in place I once again thrust my spear but this time I aim at your throat. With my grand power increase, and my armor basically made of kido based magic/sp, easily blocks your strings...I then slice at your arm leaving a big gash down your shoulder to your mid back, and then shunpo several feet from you now on the ground. 'Your turn. Show me what you have." As you turn, I hold my spear outstretched like I did for shikai but this time the point is towards the sky. Immediately darkness covers my zanpaktou and I , making me invulernable to your attacks and your slash goes right through the darkness. The darkness dissipates (as you shunpo) and spreads into the sky making a huge dome which separates us in our own special dimension (no one can enter or leave except me). Suddenly I shunpo behind you and vertically slash your whole back. You made yourself wide open. As you go to block it you see that my zanpaktou goes right through yours and your lightning has no effect on me, while I did my downward slash I used my free hand to point right behind you silently opening a portal, then while I'm intangible I open a portal right in front of me and between us (by pointing and I link the two portals (all portals are linked to the one behind you so the portal in front of me is a normal one, so it's four points for both portals)) as I open the second portal with my free hand I bring my zanpaktou back readying to thrust it forward and as the second portal opens I release the intangibility and I immediately thrust the sword forward and stab through the portal in front of us and it enters out of the linked portal and stabs you through the back. Basically I opened the portal behind you as you go to block my downward slash, then I go intangible and my sword goes right through your block to which I draw the sword back to my side readying to stab you and as I draw it back I open another portal in between us and immediately stab it (I release my intangibility as I go to stab) which goes to the portal behind you and stabs you in through the back (leaving you no time to react). You, sir, have passed thine Captain's Exam and are now Captain of Squad 7. Yay! thanks Akiza, thanks for the awesome fight xd. I officially give you the position,raiden, of "Goteijūsantai, nanabantai taicho" or "Gotei 13, 7th division captain"